This is a retelling of the classic Aladdin’s tale with a twist. Aladdin is ever the scamp readers will have remembered him from childhood stories, an orphan with personal demons—he blames himself for his parents’ death, and he has revenge on his mind. He discovers a magic lamp in a world where magic and jinnis are forbidden, but what comes out of the lamp is Zahra, a female with her own sense of right and wrong, with her own wish—to be free of the lamp forever after 500 years of being trapped and buried beneath the ruins of a forgotten and once-beautiful city. Zahra and Aladdin fall in love, but it’s not without risk or consequence as they both discover—jinnis and humans are at war with each other, and no one can know her identity. This story will enchant young readers and adult fans alike. Fans of Jessica Khoury’s previous work won’t be disappointed, and will, in fact, notice her work is maturing and finding a stronger and more lyrical voice: “He turns around fully, his grin as wide and as bright as the moon.” The story is told from Zahra’s perspective. Unfortunately, however, Khoury is weak on her character building skills. For instance, Zahra calls Aladdin a “boy” and he refers to her as a “girl,” which hardly sounds like two people capable of thinking romantically much less having the huge amount of sexual tension that is a typical of a teen novel. Furthermore, how is it that a centuries-old woman can fall for a young man who isn’t even 1/8th of her age? What is it that prevents Zahra from maturing? Because Aladdin is just as cocky and foolish as the original with wasted wishes and grandiose plans? Furthermore, Zahra, a powerful jinni, is prey to gender stereotypes, which makes her a weak character—she moons over Aladdin and pouts, she uses her sexuality to get her out of situations, and, by dint of her character, she can only do as a man, her “master,” Aladdin says. Aladdin is also gender stereotyped as the leader, the handsome hero, the sexual beast who must force himself into control lest his lust get the better of him around Zahra, etc. The characters are disappointing, but readers who have an inner teenage romantic will be able to suspend their feminist critics and move on. The world building isn’t as strong as seasoned readers will wish for: though there are poetic descriptions setting a general scene such as a daybreak or the market, there is lack of depth in actually engaging all the senses. The story is set in the Middle East yet there is no real flavor to it, just beautiful turns of phrases and occasionally lovely character descriptions, the kind that stereotyped teenage feminine fans love, such as about clothing or sexual tension. With close editing, Khoury might find those spots to flesh out the world itself to make it as lush as it deserves to be. The story’s ending is, of course, predictable. Aladdin wins the woman he loves. Zahra gets her wish. And they all live happily ever after, while sailing away, with Sinbad as the captain of the boat, to further adventures and possibly a sequel. 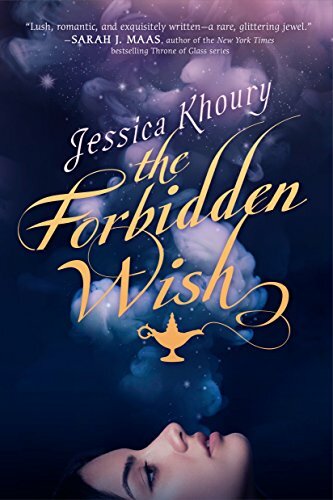 Though readers likely would have been supremely disappointed if the fairytale didn’t have the requisite ending, Khoury could have abandoned the final line of “So this is what it feels like to have all your wishes come true,” which is just saccharine. Despite all the drawbacks there are so many beautiful moments in the story, and these alone make much of the story beautiful in the larger strokes that skip the detail.